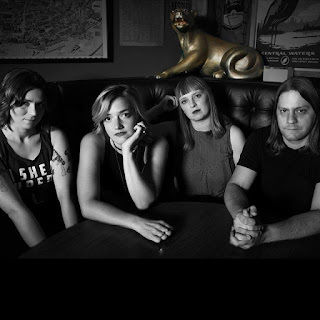 If It's Too Loud...: Fox Face - "Clever Girl"
Milwaukee, WI isn't exactly known as a beacon for feminist punk, but sometimes, that's exactly the point. Fox Face have their debut album coming out next month, and right now we can hear a song from that album. "Clever Girl" is everything you want in a riot grrrl style punk song. It's loud and perfectly obnoxious, but with just enough of a hint of melody to be oddly catchy. It reminds me mostly of older Sleater-Kinney but with a smidge of L7's thrash. It's a throwback sound, of sorts, but somehow it doesn't sound like 90's nostalgia. Maybe it's the political climate of this country, but Fox Fire is what we need right now. You can listen to "Clever Girl" below. Fox Fire's debut album, Spoil + Destroy, will be out November 3 on Dirtnap Records. For more on Fox Fire, check them out on Facebook.